We had just gotten back from a trip to New York City, (where, by the way, everyone was totally thrilled to hear tales of chickenry) and the first thing I did when getting home was say hello to the chickens. A kid from the local 4-H group had looked after them while we were gone, so I knew they’d be fine, but I had missed them. I stuck my head in to say goodnight, and as is my habit since Boss Chicken got sick and spent a night outside, I counted them to make sure they were all there. 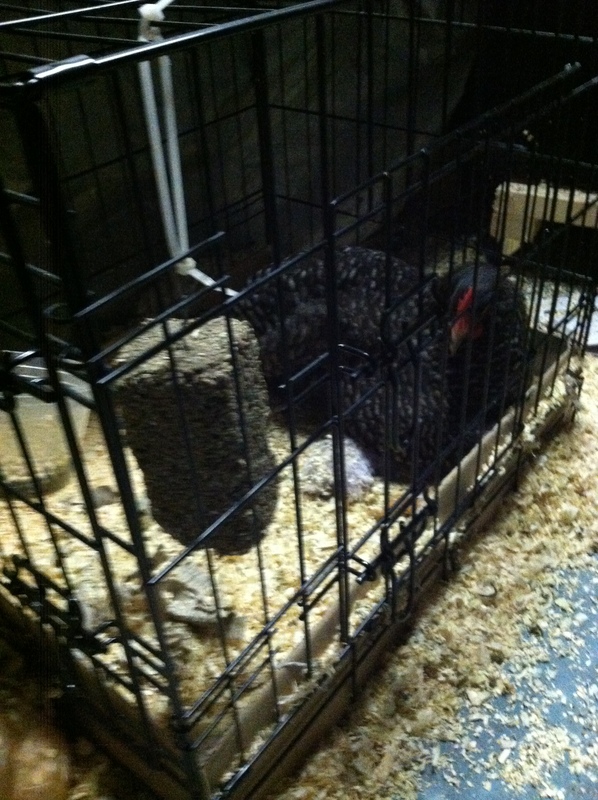 With Boss Chicken in quarantine, there should be 5 on the roost. I counted 4. I counted again. Still 4. Third time’s the charm, right? Not if you were counting these same chickens. I was about to look under the coop, fearing a repeat of the Boss Chicken Incident, when I noticed a small head sticking out of one of the nesting buckets. There was the missing Mandrell Sister, but what was going on? Immediately I thought I had come home to another sick chicken, but since she was in the nesting bucket, I quickly changed my mind to thinking that she may have gone broody. Sure enough, she was sitting on a bunch of eggs. I removed her from the bucket, and she remained puffed out and squat, and was making a very weird noise. The best way I can think to describe it would be “power cooing.” It was like a coo put on repeat and sped up. This was weird, but I decided to not freak out, and instead put her back in the bucket, since that’s where she wanted to be. I then turned to the internet. Took away the decoys, just to remove any temptation. It seems there are a lot of different ways to snap a hen out of being broody, or, as some people put it “break a broody hen,” which sounds a lot harsher. The most natural way would be to get some fertilized eggs for her to hatch. When the eggs hatch, she stops being broody. I suppose I could talk to the farmer down the street about buying some fertilized eggs, but you may have noticed that I call this “Too Many Chickens!” not “I Think There Must Be Ways To Get More Chickens,” so I am going to hold off on this one for now. Not that I wouldn’t like to have baby chicks running around, but I can’t do this every time a hen goes broody, or we’ll fill up the coop post haste. This is my first encounter with broodiness, but in my reading I’m finding that Buff Orpingtons get broody a lot, and we have three of them. I could double or triple the size of the flock before summer is over. Unhatchable, due to lack of rooster. Another method of beating broodiness is to dunk the hen in cold water. This seems somewhere between trying to prove the chicken is a witch, and waterboarding. Neither suits my tastes. I think it works on a similar principle as scaring away hiccups, but it’s still pretty chilly at night around here, so I’m not too thrilled about leaving a soggy hen out in the cold. You also may be familiar with the saying, “madder than a wet hen,” and I’m not sure I want to see just how mad that is. Since we have a good amount of snow still, I did try putting her in a snowbank while gathering the eggs. The dunk technique seems to work on the idea that you need to lower the bird’s body temperature, and snow seemed better than dunking. It did seem to convince her to go out into the run to eat, but at night she was right back in the bucket. What’s interesting is that everyone seems to have heard of the water dunk method, but I didn’t read any accounts in which it actually worked. Mixing it up by sitting between the two nesting buckets. The technique that best fits my lifestyle would be to take her away from the bucket and put her somewhere she has no opportunity to nest, like a dog crate, or an unused rabbit hutch. I could do this, except Boss Chicken is already convalescing in our dog crate. I don’t think putting them both in there is a good idea, but I may have to figure out some way to isolate her for a few days to see if it can do the trick. I may have to just put her in a box and see what happens. Substitutions don’t always work though, as evidenced by my failure when using snow instead of a bucket of water. Chickens want the real deal. There’s nothing wrong with this behavior, it’s actually totally natural. 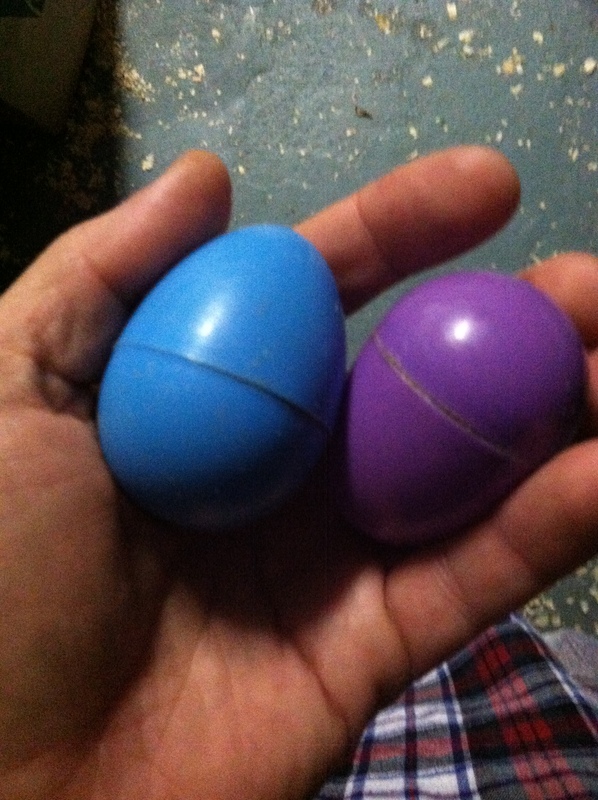 My worry is that she might not ever come out of it if there are no eggs that will hatch. 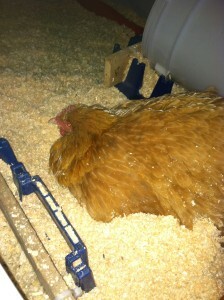 When a hen gets broody, they don’t leave the nest, so they don’t eat or get water. It takes three weeks to hatch an egg, so after that, they may start to fade away from malnutrition. I don’t want that to happen, so the best plan would be to make this stop. How to do this remains the issue, but I have muddled my way along this far, I’m sure I can do a little more muddling, even without waterboarding anyone. Or at least not any chickens. This entry was posted on Friday, March 15th, 2013 at 4:00 pm	and is filed under Backyard chickens, Broody hens, Chickens. You can follow any responses to this entry through the RSS 2.0 feed. You can leave a response, or trackback from your own site. 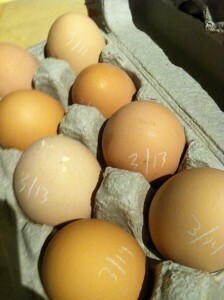 I’ve got 2 RI Reds that are 26 weeks now and laying daily. They free range the yard duinrg the day and come back to roost in the evening. I’ve only had them for 6 weeks, and now I’ve got 15 new chicks that have grown to a little over 3 weeks old.In another week or so the chicks will be ready to go outside to the coop and run since they’re feathering out nicely and I’ll be ready to take back my garage!I think I can net off a portion of the run (VERY secure from other animals entering from outside or above) for the chicks so I can keep everyone on the right kind of chick food and layer food. The reds need the nesting boxes in the coop to lay so I shouldn’t get them all into the coop yet right?Do you think evening temps in the 60 s will be OK for the younger chicks? Daytime temps have been in the 80 s and 90 s so it’s the nights and inclement weather that worries me about them being out in the run all the time.It’s my understanding that the chicks need chick food until 9 weeks and then grower food until 19 weeks. That seems like forever if they have to be separated! 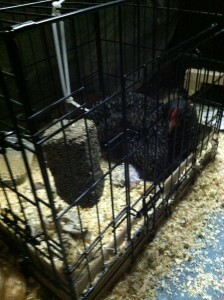 I’m no expert, but if the chicks are totally feathered out, then temps in the 60s at night should be fine. 3 weeks seems very young to be fully feathered out to me, though. They should also have some sort of shelter to go into, especially if inclement weather is a possibility. Mine were much older than that before I finally let them out. You may want to see what backyardchickens.com has to say about this. Keeping them side by side like that should be helpful in terms of them all getting used to each other. You don’t want to dump the chicks right in with the older ones without giving them a chance to get to know each other.